Vera Bradley is throwing a party again this year for the namesake. The Vera Bradley birthday party will be all day in stores on Thursday, August 9. Check out the photo below of the postcard with all of the details of the day. Open - 2pm Buy one items, receive one half off. Enter for a chance to win a $100 gift card. 2pm - 6pm Enjoy $20 off backpack and tote styles. Enter for a chance to win your favorite item. 6pm to Close Receive 20% off any purchase. Enter for a chance to win a $250 Vera Bradley gift set. Enter our grand prize drawing for a chance to win an in-store party for you and 10 friends, plus $300 in gift cards. Sounds like they have a great party planned! Follow OhMyVera! on Facebook and Twitter! So through Google Analytics I can tell a little about my blog readers and know that I have readers all over the place, but recently I have started getting contacted by more international readers! I have also heard from readers in Costa Rica and Australia in the last week! 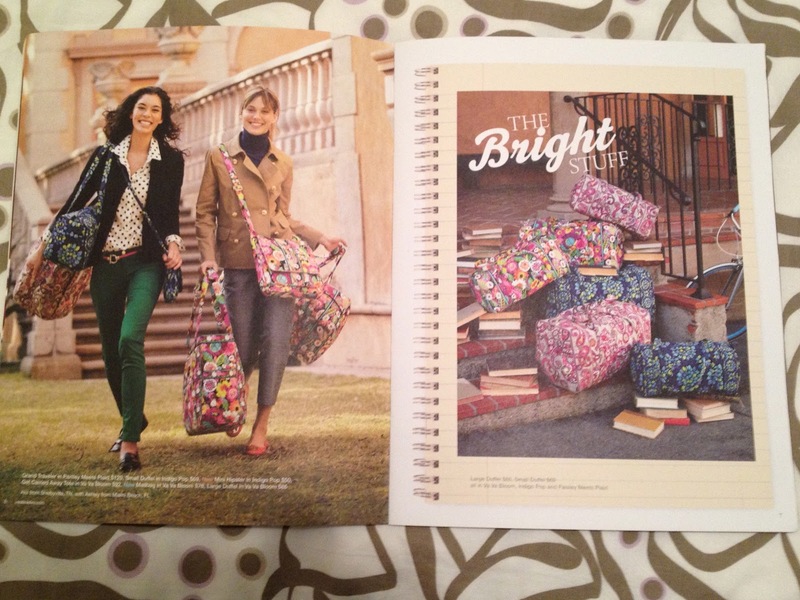 It is really fun to hear from Vera Bradley fans from around the world. Some of you might not realize, but Vera Bradley doesn't ship internationally, so it can be hard to get the bags in other countries. That is what most of the emails are about. So if you are reading this from another country, it would be great to hear where you are! 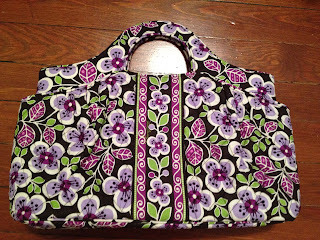 Please leave a comment and let us know where you are from and maybe share your favorite Vera Bradley bag or color. Follow OhMyVera! on Facebook and Twitter! A Fresh Batch of Scarves from Boutique Inspired Designs! Jessica from Boutique Inspired Designs just emailed me to let me know she has been working on scarves to match some of the recent Vera Bradley colors like Pricilla Pink, Summer Cottage, Limes Up, Indigo Pop & Paisley Meets Plaid! These scarves are great for winter, but you can stock up now because Jessica is offering a Christmas in July promotion now through August 10th for free shipping on any order with the code: OHMYVERA . 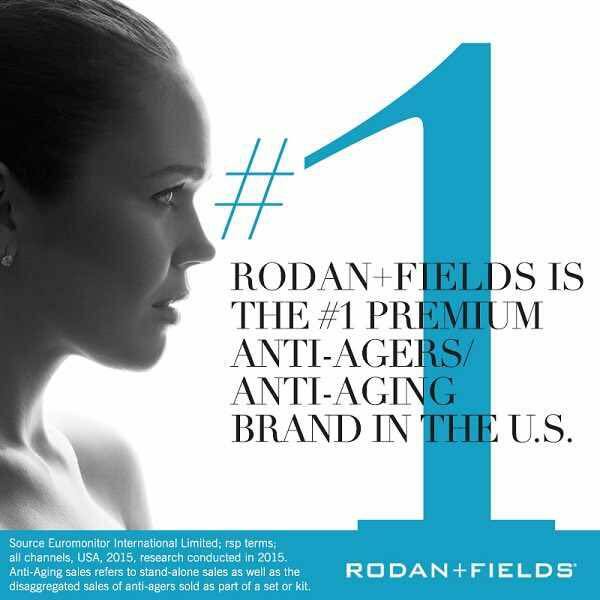 I love mine and know you will too! Keep checking out her site, because she will be coming out with scarves to match more colors soon! Check out my previous posts about her scarves here and here. 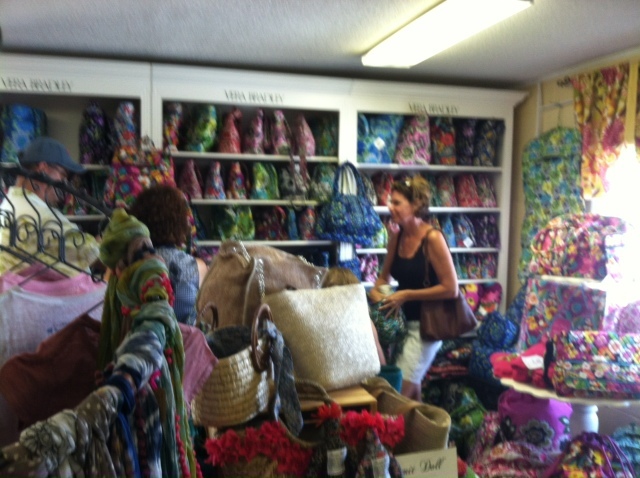 My friend Jessica is on vacation in Surf City, NC and found this huge display of Vera Bradley at Bumblebee! I wish I was at the beach! Save 30% in Stores Now Through Sunday! Now through Sunday you can save 30% off one item when you click here for a coupon! 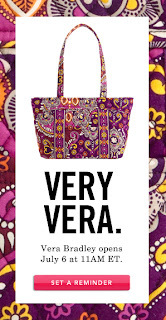 The coupon is good through Sunday and it is only good at Vera Bradley stores. 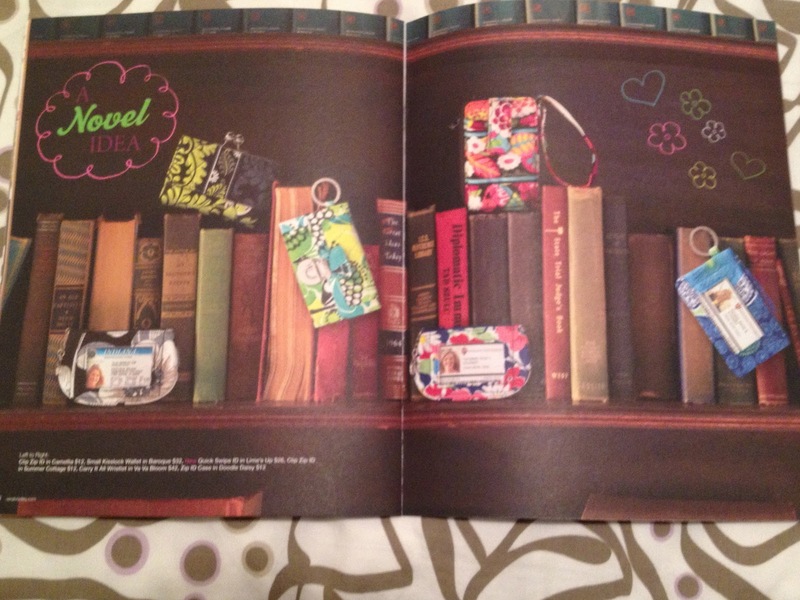 I think that I am going to try to go on Saturday morning to pick up a Smart Phone Wristlet in Va Va Bloom, we shall see though! What would you like to buy at 30% off? Thank you to Emily for sending in this Vera Sighting from Pretty Little Liars! They have a bag in Loves Me. 60% off Lemon Parfait, 50% off Viva La Vera and 40% off Plum Petals. Only through Sunday. I have been on the east coast for over a year now, but today is my first day visiting the Atlantic Ocean! We rode our bikes from the house to the beach and I picked this bike because it has a basket for my 3 Pocket Happy Snails Tote. I hope everyone is enjoying their weekend! 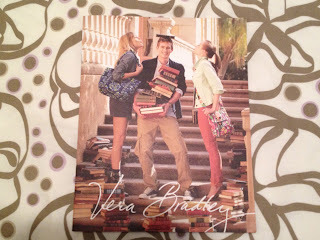 Vera Bradley Promotions for Fall 2012! Free lunch break, lunch bunch, or lunch date (retail $34) when you spend $100 or more at participating retailers and Vera stores. 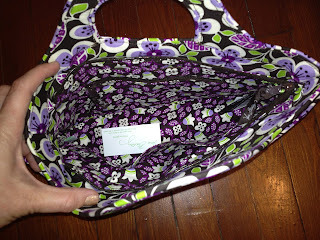 Last week Vera Bradley was on Rue La La and they had some great deals. I just couldn't pass up this Plum Petals Abby because I have been wanting an Abby for a while! 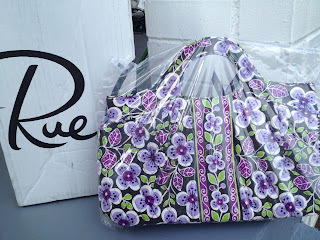 It was only $35.90 on Rue La La, and is on sale for $54.40 on VeraBradley.com and was originally $68! I was so excited when my Rue La La package arrived today! New Plum Petals Abby all wrapped up. 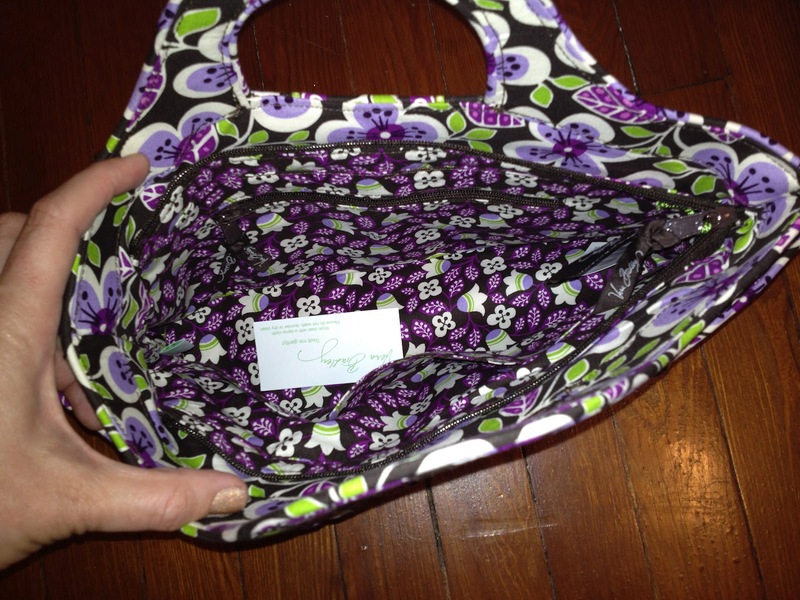 The inside has 3 slip in pockets and a zipper pocket. Plus there are pockets on the ends of the outside. Yesterday was the big day! 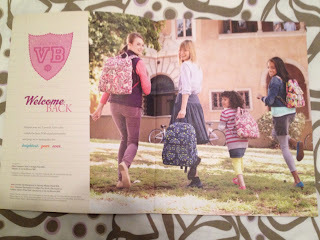 The first set of Vera Bradley Fall 2012 colors were released: Indigo Pop, Va Va Bloom and Paisley Meets Plaid. I love these colors, they are so bright and fun! 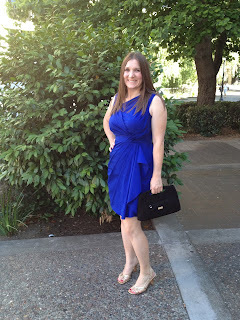 I picked up an Indigo Pop Hipster during the preview and I love using it. It goes great when I am just wearing a basic t-shirt and a pair of jeans. I can't wait to pick up something in Va Va Bloom! I thought this one was a little bright when I saw it at the preview and wasnt too excited about any of the pieces they were previewing it in, but now I am excited to check it out in a Mailbag or maybe the Smartphone Wristlet. I will have to see if I can make it to a Vera Bradley store this week! I picked up a copy of the Vera Bradley Back to Campus Catalog last week on my vacation to California. 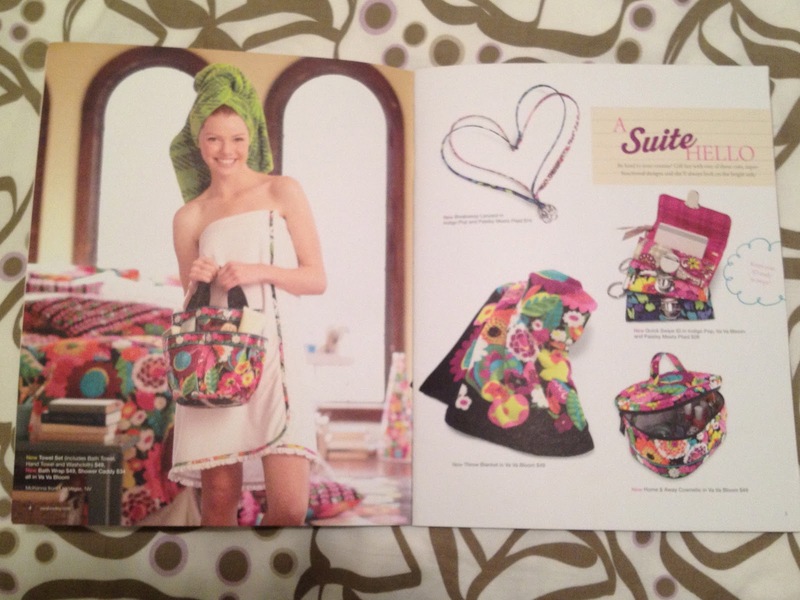 Here are the photos of the catalog, but it can also be found online by clicking here. 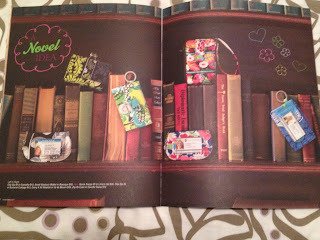 Check out the Vera Bradley video at the bottom of the post too! If you picked up one of the new styles, I would love to hear about it! Leave a comment and let us all know what you think! Still getting back into the swing of things after returning from vacation in California last week. I had a heck of a time getting back to the east coast with all of the storms and was re-ticketed 5 times!!! Made it home 24 hours later than expected, but at least I am back! Here is a photo of my and my Vera at the wedding that I went to. I couldn't find my gold purse, so black had to do :) I love this Black Mircofiber Clutch! It holds so much stuff and the zebra lining is really fun. Which bag do you carry to weddings and special occasions? PS. 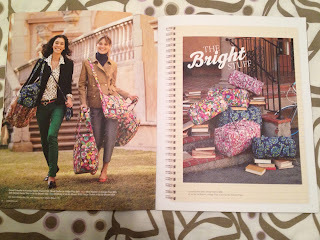 I hope you all enjoyed the first day of the Vera Bradley Fall 2012 launch! Vera Bradley - QVC Convertible Crossbody Hobo! Vera Bradley's first three Fall colors (Va Va Bloom, Paisley Meets Plaid and Indigo Pop) release on July 10, less than a couple of hours from now! They will be on QVC for a few shows and you can pick up the TSV (Todays Special Value) The Crossbody Convertible Hobo! I just got home from my vacation and it was a traveling headache getting home, so I am off to bed. Who is staying up to watch QVC? Can't wait to hear what everyone gets! If you are shopping online at Vera Bradley or QVC remember you can use Ebates to get cash back on your purchases! Backpacks are 50% off this weekend online at verabradley.com. If you're shopping online use Ebates to get cash back! I have a Bookbag and I love using it for a day out sight seeing! 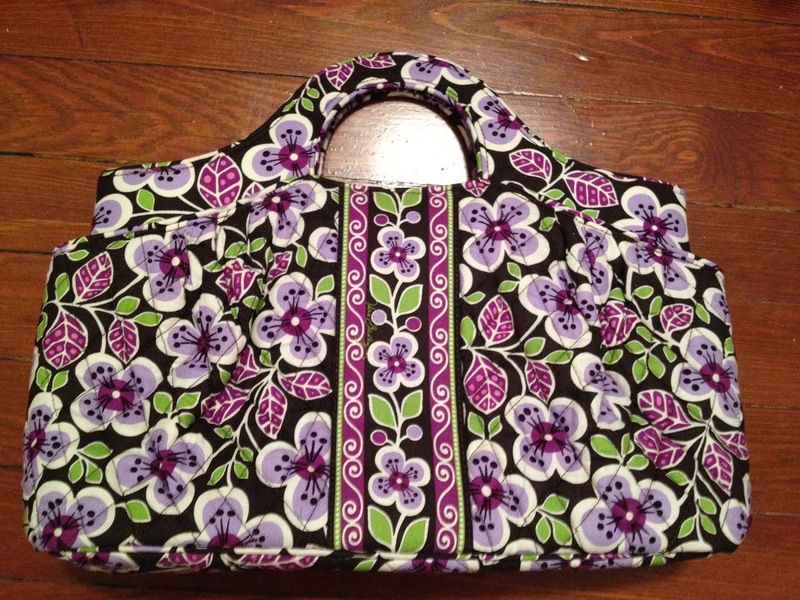 Vera Bradley on Rue La La! 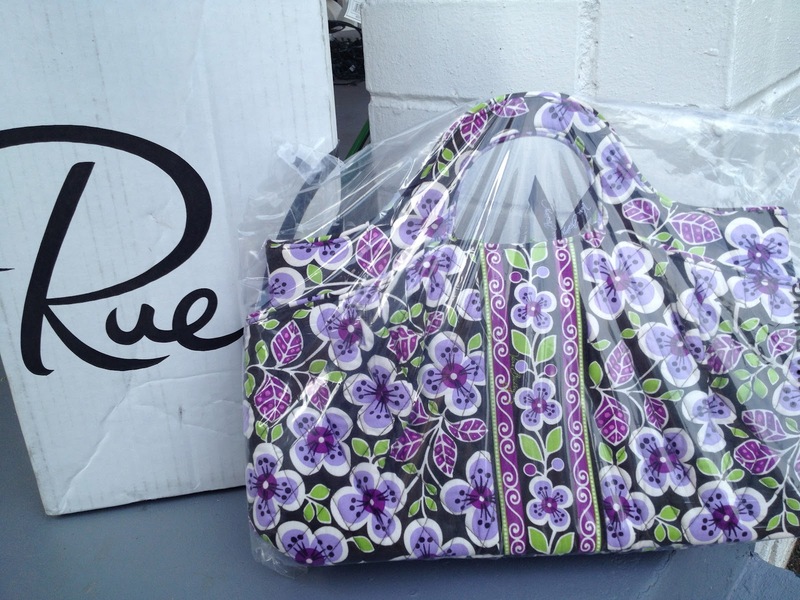 Vera Bradley is going to be on Rue La La starting at 11:00am EST...in just a few minutes! 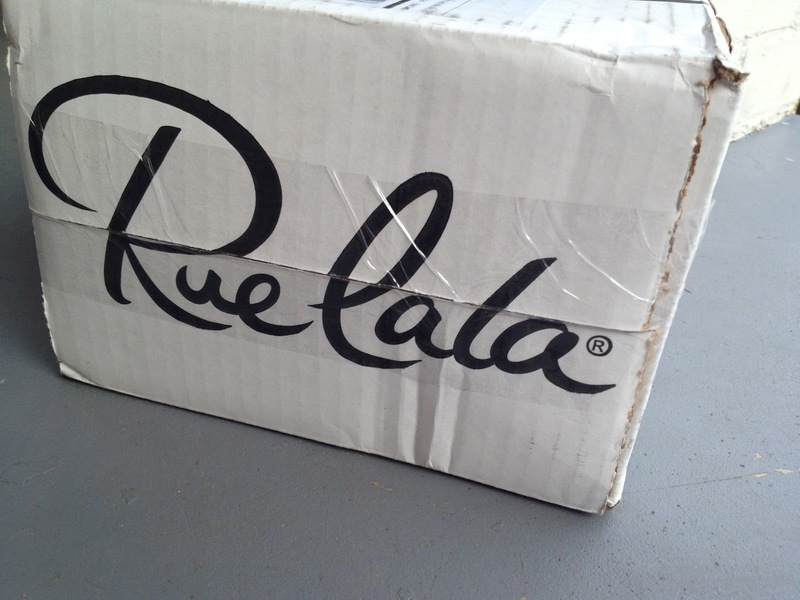 You have to be a member to sign in and check out the shop, and you can join by going here: http://www.ruelala.com/invite/ohmyvera. It looks like they are going to have Safari Sunset and Folkloric! I can't wait to see what else they will have. I'm on vacation this week, so posting will be light and I wont be responding to comments or emails. I will catch up when I return! Enjoy your week and have a Happy Independence Day!